Why are plums the understated fruit? I mean this time of year as I scout out my love for blood oranges I also look for these garnet beauties. My research says the plum is the second most popular fruit next to the apple. My grandmother used to make plum wine stashed under the kitchen sink to better ferment. Boy, I would love to get my hands on her recipe. Maybe someday I’ll hit the jackpot and find it and make a batch. I was too young to try at the time, but I do remember it being very potent smelling and her saying with a smile this is the wine you sip in a sherry glass, you don’t need a whole lot to warm you up! My heartfelt promise to you is that you can learn this salad in like five minutes, with less than five ingredients. AND if I did the math, your meal is probably less than $5 a serving to make. How’s that for love? My biggest contender is always how to tell if your fruit is ripe and ready to eat? Especially with plums, I cannot see like you would a banana or even an avocado what stage I am buying it in. I do know from eating fruit growing up on the farm right off the tree that most produce doesn’t get to the sweetest ripest stage it could get when you buy from your grocery store. The fruit is picked the pre-ripening stage to make sure it holds up during shipping, which means that fruit hadn’t had enough time in its environment to develop to its sweetest potential. For this reason, I feel its extremely rewarding to know that during the season I can get the best, ripe and traditionally lower cost when I buy directly from the farmer at the farmers market. Plus, support our local community, who doesn’t love doing that? The best way to tell if a plum is ripe is to squeeze it if it gives a little its ready gently. If it still hard leave on the counter for a couple of days. I found this particular plum (red plum) to be the best plum to grill. Just slice, pit, and coat a bit of olive oil and grill for 1-2 minutes each side. Easy! 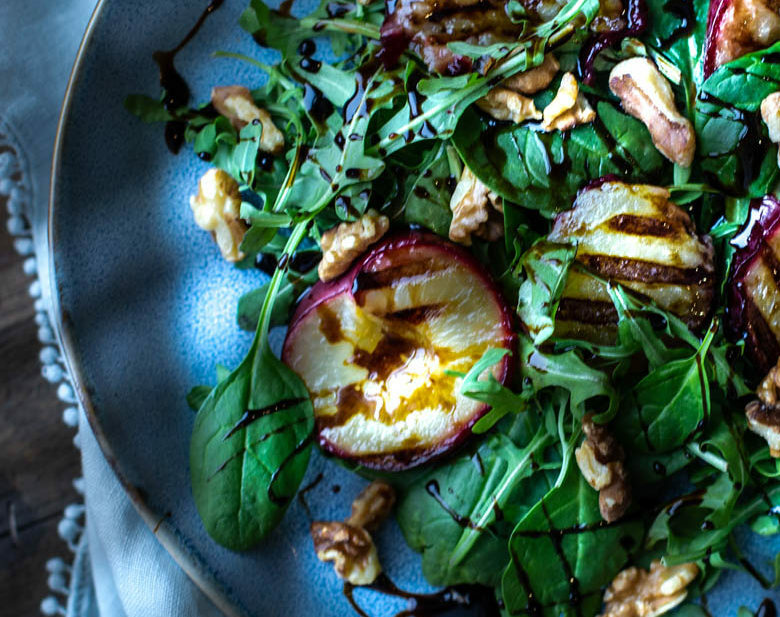 Grilling brings out its sugars leaving you with a smokey carmelized flavor that pairs perfectly with arugula and spinach blend. Ready for a heart-healthy salad? Let’s do this! 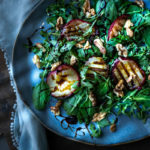 So, I feel it’s only relevant to have a warm salad for winter like this sweet grilled plum salad. I have often wondered how chefs in restaurants serve similar salads with incredible ingredients that are so simple, yet we don’t think its something we can master. Heat a grill pan over medium heat or use a panini grill. If your walnuts are raw, toast them up in the pan before grilling the plums. Just stir them around for 6 minutes till toasty and set aside. Wash, slice and pit plums. Slice plums in 1/2 inch slices. Coat each slice with olive oil and grill for 1-2 minutes on each side. Set aside. 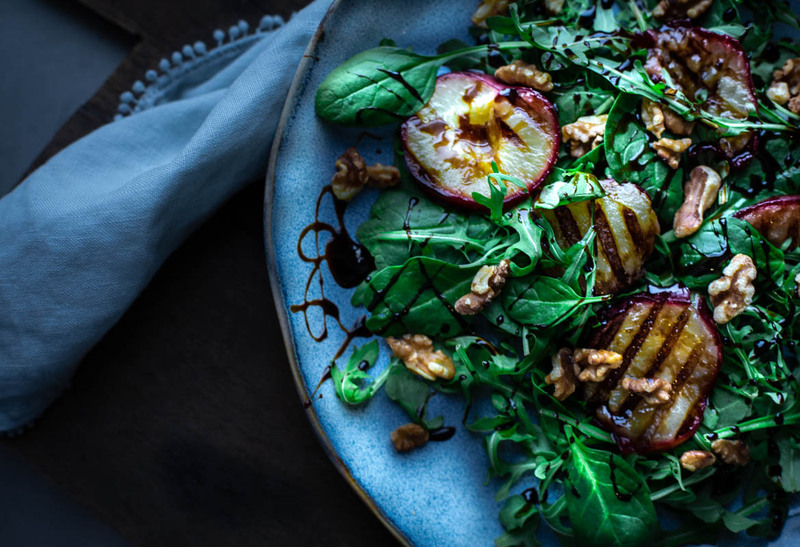 Plate your arugula and spinach, arrange grilled plums on top, sprinkle two tablespoons of walnuts on each plate and drizzle with reduced balsamic reduction or what is called balsamic glaze. 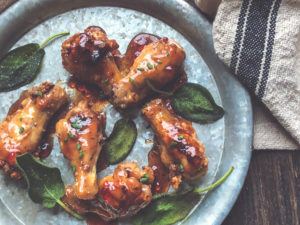 No need for oil as this glaze and the sweetness from the plums is all you need. I used Rachel Rays Balsamic Glaze as I didn’t have time for reducing it myself. Its okay to simplify!